As actors, actresses, singers and other celebrities come out and offer their help to aid Haiti, “Hope for Haiti Now,” in the wake of the devastating 7.0 magnitude earthquake, the Hollywood LEFT’s favorite Marxits, socialist, Venezuelan leader Hugo Chavez accused the US for the earthquake in Haiti last week. Russia Today: Venezuelan leader Hugo Chavez has once again accused the United States of playing God. But this time it’s Haiti’s disastrous earthquake that he thinks the U.S. was behind. Spanish newspaper ABC quotes Chavez as saying that the U.S. Navy launched a weapon capable of inducing a powerful earthquake off the shore of Haiti. He adds that this time it was only a drill and the final target is … destroying and taking over Iran. Hugo’s Lost that Loving Feeling? According to the Venezuelan voice of sanity, the United States apparently possesses an “earthquake weapon” that set off the catastrophic quake in Haiti and killed 200,000 innocents. Wonder why Chavez would think that Comrade Obama would do such a thing seeing that he considers Obama more LEFT than he or Castro. 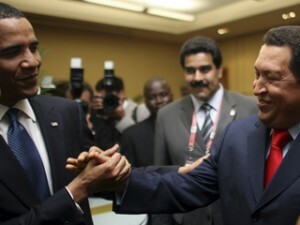 Or is it that Chavez thinks all US Presidents are the Devil. All those state censored cable channels that he gets has made him soft in the head. it needs to be spanked. If the US had such a weapon, Hugo-baby, we would have set it off right under YOUR sorry @ss. Then we could have gone in a taken all of YOUR oil. “Russia Today” is an interesting channel. A couple of nights back, one of Putin’s minions was interviewing an “American filmmaker” on the evening newscast. The filmmaker was sharing his conclusion that the USA was guilty of “criminal negligence” for the way it was providing aid to Haiti and its people. I vote to drop the earthquake bomb on Iran today. Putin is an evil, twisted Communist and murdering narcissist deep in his black heart which is full of hatred and contempt of many. Really, there are so many things about this Man that are twisted and his silence should never be misinterpreted for weakness. There is nothing he would love to see more than the destruction and complete ruin & devastation of the United States. Don’t think he’s ever really been shy about expressing that fact, either.